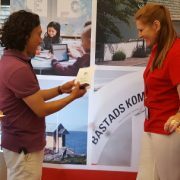 Swedish Hockey League team Rögle BK had kindly invited the Biodolomer® for Life project to exhibit at the club’s sustainability day. 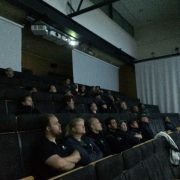 The day was arranged on December 26th, during their game against Linköping HC. It was part of the club’s efforts to work for a sustainable future; both as a youth player academy, as well as a dedicated member of society. Approximately 4700 people had decided to put their Christmas celebration on hold and instead visit Lindab Arena. The exhibition was open for the audience before and during the game. Biodolomer for Life had been given a place just inside of the entrance, with unimpeded exposure towards the visitors. This proved to be the ideal place from which to showcase our messages and product samples, as well as striking up conversations with passersby. 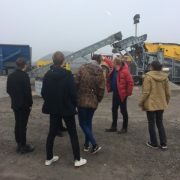 Interested visitors had the opportunity to learn more about Biodolomer®, renewable fully biodegradable biomaterials and the circular economy. They were also shown how the Biodolomer for Life project fits into it all. 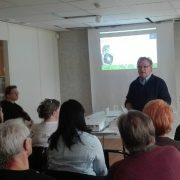 Judging by the reactions, interest in biomaterials is gaining momentum, with negative side effects from plastics being common knowledge. 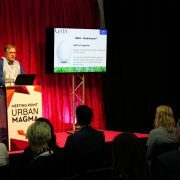 However, the information provided by producers and retailers regarding the environmental attributes of their products often are difficult to understand. Claims of being “green” or “recyclable”, whilst factually correct, does not always mean what the consumers believe they mean. Instead, many of these products are not biodegradable or recyclable and will not fit into the circular economy. Biodolomer is certified to be both biodegradable and compostable, is produced from renewable materials and, as is one of the purposes of the Biodolomer for Life project, can help close the loop in the circular economy. 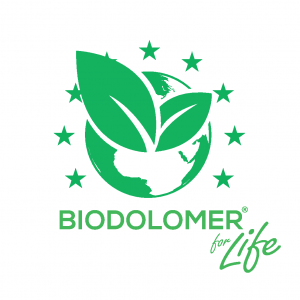 The “Biodolomer® for Life” project is focused on closing the loop in the circular economy through the introduction of Biodolomer® – a fully biodegradable biomaterial – and is part of the EUs LIFE program; the financial instrument supporting environmental, nature conservation and climate action projects throughout the EU. 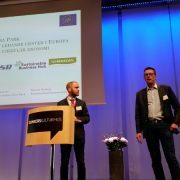 The project’s key principals are Båstad Municipality, GAIA BioMaterials AB and NSR AB. This publication is produced with the contribution of the LIFE programme of the European Union. It reflects only the author’s view and the Agency/Commission is not responsible for any use that may be made of the information it contains. © Copyright - Biodolomer For Life "This website is produced with the contribution of the LIFE programme of the European Union. It reflects only the author's view and the Agency/Commission is not responsible for any use that may be made of the information it contains."